This morning before pulling out of the carport to head to work, I decided it was time to take out the Christmas CD and put something different in. I shuffled through the stack of playlists burned on to CD’s and found one that had nothing written on the front. I popped it in the CD player and immediately recognized the first song, and the second and so on. I thought for a moment about where this CD came from and then I remembered – my closest college pal had put the playlist together for me. She chose songs that the two of us listented to often; songs with special memories attached to them. The whole way to work, I sang along, laughed, reminisced and ultimately, felt like I had just gotten a great big hug from Marisa. This scene made me think about the power that music has. It can make our emotions soar joyfully, or all but pull tears from our eyes. It can soothe, comfort, inspire – the list goes on. And then I started thinking about why music is such a powerful tool when we use it to worship the Lord. We know that worship and music went hand-in-hand during biblical times. Psalms 95:1 says, “Oh come, let us sing to the Lord; let us make a joyful noise to the rock of our salvation!” (emphasis mine). There are many MANY more examples of singing and praising God with music. I think God created music with a special plan in mind. 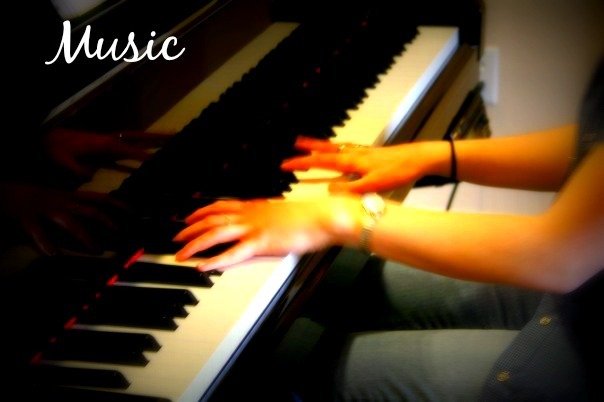 Music has this way of easing our spirit and helping us open up to worship God and listen for His voice. It reminds me of water – gentle enough to wash the most delicate skin, yet strong enough to carve the Grand Canyon. I’m so curious to know your thoughts on this idea. Please let me know what you think! Posted in Encouragement and tagged Bible Study, God, music, scripture. Bookmark the permalink. I think you know how much music means to me. It lifts me up when I am down and fills my soul with joy. It ushers me into a place where I can worship and know that God is there. Thank you for sharing this. Love you.